married men who are already involved in church business.
" Then we have to decide what tasks they can take on, for example in remote communities ," he added in the interview with German weekly Die Zeit. They think that in addition to priests who take a vow of celibacy, older, married men with a long commitment to the church could also be considered. 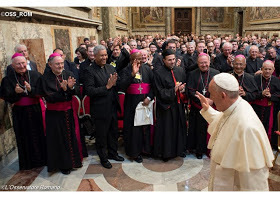 0 Response to "Catholic Church To Consider Making Married Men Priests-Pope Francis"